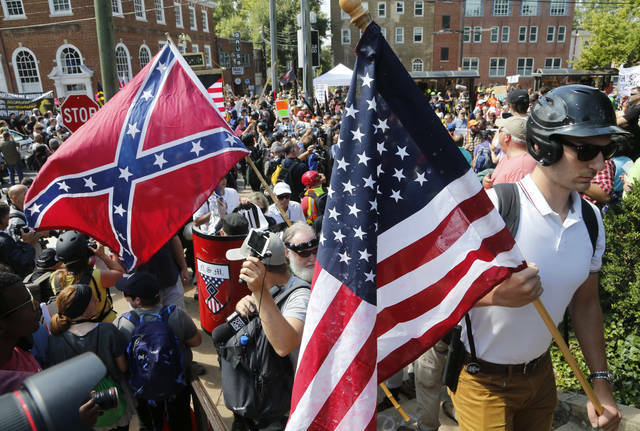 White nationalist demonstrators walk into Lee park surrounded by counter demonstrators Saturday in Charlottesville, Va. Gov. Terry McAuliffe declared a state of emergency and police dressed in riot gear ordered people to disperse after chaotic violent clashes between white nationalists and counter protestors. BEDMINSTER, N.J. — President Donald Trump on Saturday blamed “many sides” for the violent clashes between protesters and white supremacists in Virginia and contended that the “hatred and bigotry” broadcast across the country had taken root long before his political ascendancy. That was not how the Charlottesville mayor assessed the chaos that led the governor to declare a state of emergency, contending that Trump’s campaign fed the flames of prejudice. Trump, on a working vacation at his New Jersey golf club, had intended to speak briefly at a ceremony marking the signing of bipartisan legislation to aid veterans, but he quickly found that those plans were overtaken by the escalating violence in the Virginia college town. One person died and at least 26 others were sent to the hospital after a car plowed into a group of peaceful anti-racist counterprotesters amid days of race-fueled marches and violent clashes. And officials later linked the deaths of two people aboard a crashed helicopter to the protests, though they did not say how they were linked. Speaking slowly from a podium set up in the golf clubhouse, Trump said that he had just spoken to Gov. Terry McAuliffe, D-Va. “We agreed that the hate and the division must stop, and must stop right now. We have to come together as Americans with love for our nation and … true affection for each other,” he said. After completing his statement and the bill signing, Trump then walked out of the room. He ignored reporters’ shouted questions, including whether he wanted the support of white nationals who have said they backed him or if the car crash in Virginia were deemed intentional, would it be declared to be terrorism. Other Republicans were far more explicit in their denunciation of white supremacists. White nationalists had assembled in Charlottesville to vent their frustration against the city’s plans to take down a statue of Confederal Gen. Robert E. Lee. Counter-protesters massed in opposition. A few hours after violent encounters between the two groups, a car drove into a crowd of people peacefully protesting the rally. The driver was later taken into custody. Mayor Michael Signer said he was disgusted that the white nationalists had come to his town and blamed Trump for inflaming racial prejudices with his campaign last year. Disturbances began Friday night during a torch-lit march through the University of Virginia before escalating Saturday. The president’s reluctance to condemn white bigots also stood in stark contrast by his insistence of calling out “radical Islamic terrorism” by name. “Now, to solve a problem, you have to be able to state what the problem is or at least say the name,” Trump said in a general election debate. https://www.delgazette.com/wp-content/uploads/sites/40/2017/08/web1_117984825-4beeb5fe8a634099a29e4e26b0c84fe5.jpgWhite nationalist demonstrators walk into Lee park surrounded by counter demonstrators Saturday in Charlottesville, Va. Gov. Terry McAuliffe declared a state of emergency and police dressed in riot gear ordered people to disperse after chaotic violent clashes between white nationalists and counter protestors.